Li Zicheng (ca. 1606-1645) - The Ming Dynasty was not immediately replaced by the Qing. There was about a year long interval in which China was ruled by the Shun and its leader, Li Zicheng. Known as the "Dashing Emperor", he was originally a lowly shepherd who became a skilled horseman and archer by his early twenties. We don't know for sure how he rose to power, but legend has it that he had been chained and put on public display in his town square after failing to repay a loan to a corrupt magistrate of the Ming emperor. The local people were so outraged by his treatment that they tore off his shackles, moved him to safety in the countryside and made him their leader. Through a peasant uprising he overthrew the Ming government and was proclaimed emperor of the newly established Shun dynasty. However, his position was not secure and less than a year after becoming emperor, he was defeated at the Battle of Shanhai Pass. The Qing then took over and the fate Li Zicheng is not known. 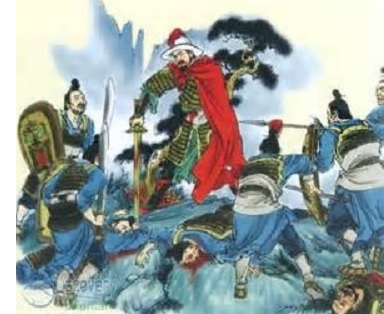 History records that he was killed by the Qing in 1645, but there are several alternative tales about him. One of the more fanciful is that he became a Buddhist monk and lived out the rest of his life quietly in a monastery.